Swann Galleries’ November 1 sale of Old Master Through Modern Prints contains nearly 500 lots, including an impressive selection of works by Pablo Picasso. Among these, two prints stand out: Le Repas Frugal and La Femme au Chapeau (Portrait de Jacqueline à la Fraise et an Chapeau). Lot 332: Pablo Picasso, Le Repas Frugal, etching and drypoint, 1904. Estimate $100,000 to $150,000. Le Repas Frugal is characteristic of Picasso’s Blue Period, 1901-04, which explored the experiences of those who were poor and lived in the bohemian neighborhoods of Spain and Montmartre, Paris, where the artist lived in the early 1900s. 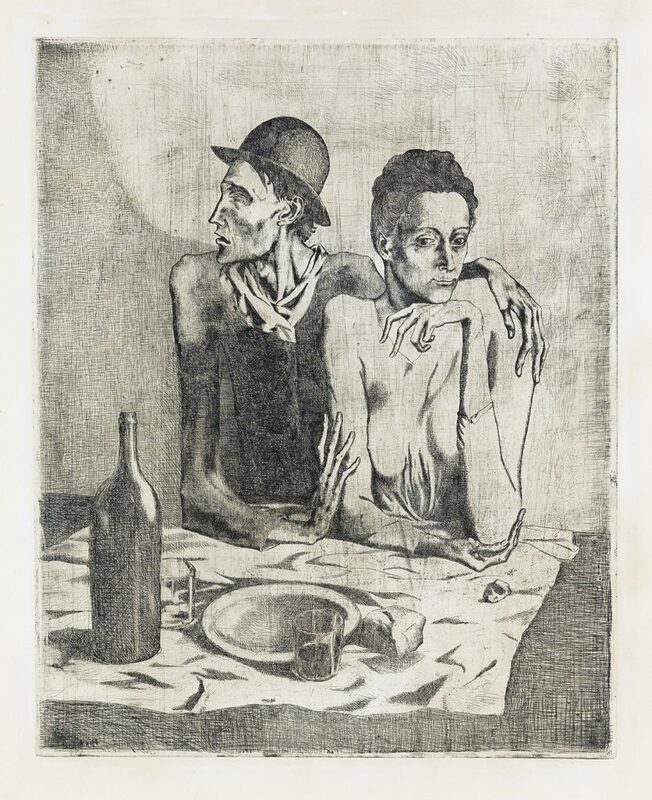 After rudimentary instruction in the art of printmaking, and having only completed one other print in 1899, Picasso executed this large, ambitious etching of an emaciated, meditative couple and their sparse meal. During this time Picasso himself was also poor and purchased the plate for Le Repas Frugal second-hand. In the upper right of the etching, you can see the remnants of the previous etching ghosting through the background. The print is part of the Saltimbanques Suite, along with 11 drypoints and two additional etchings created by Picasso between 1904-06. Iterations of Le Repas Frugal have performed well at auction in the past: Le Repas Frugal sold at Swann in 2006 for $132,000 over an estimate of $80,000 to $120,000. 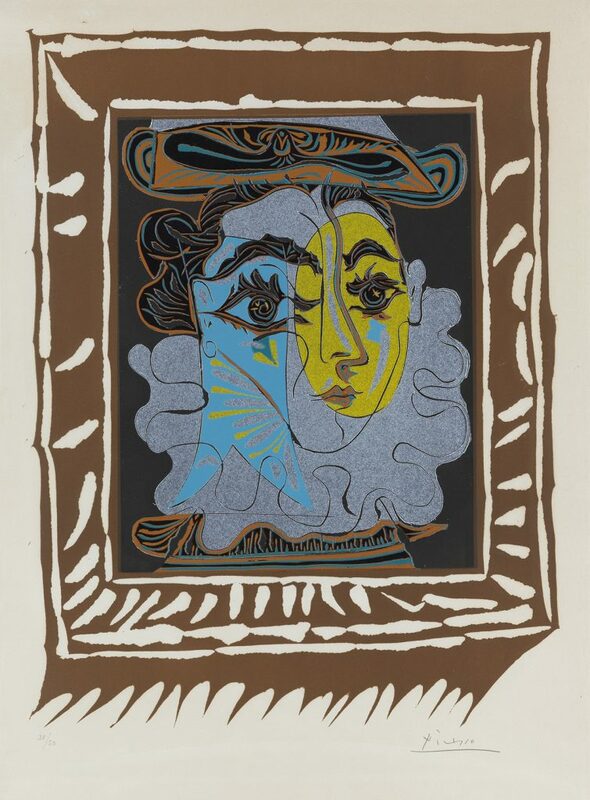 Lot 343: Pablo Picasso, La Femme au Chapeau (Portrait de Jacqueline à la Fraise et an Chapeau), linoleum cut, 1962. Estimate $80,000 to $120,000. La Femme au Chapeau depicts Jacqueline Roque, Picasso’s second wife. Picasso’s entry into the production of color linoleum cuts coincided with his introduction to Jacqueline, and of the more than 150 prints he produced during the 1950s and 1960s, none stand out more for their boldness of execution and sheer artistry than those of Jacqueline. Colored linoleum cuts from the 1950s and 60s have achieved great numbers at Swann in past years: Homme à la fraise sold at Swann in 2011 for $144,000. 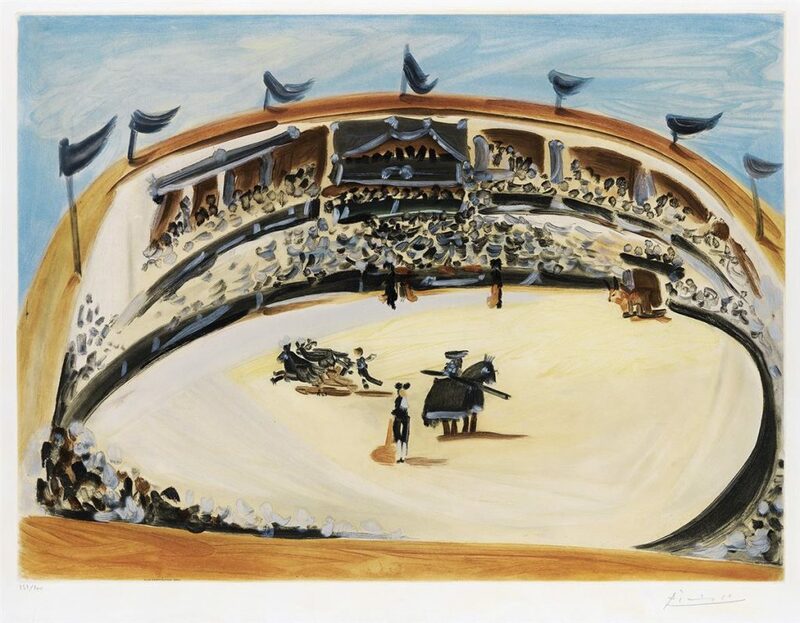 Lot 347: Pablo Picasso (after), La Corrida, aquatint, 1956. Estimate $15,000 to $20,000. “After” prints are etchings, aquatints or lithographs produced after an artist’s well-known works. Read More. Picasso assisted the printers closely throughout the process, choosing each image and which technique to use, directing the lithographer or engraver, and correcting proofs and authorizing the work by hand-signing the edition. 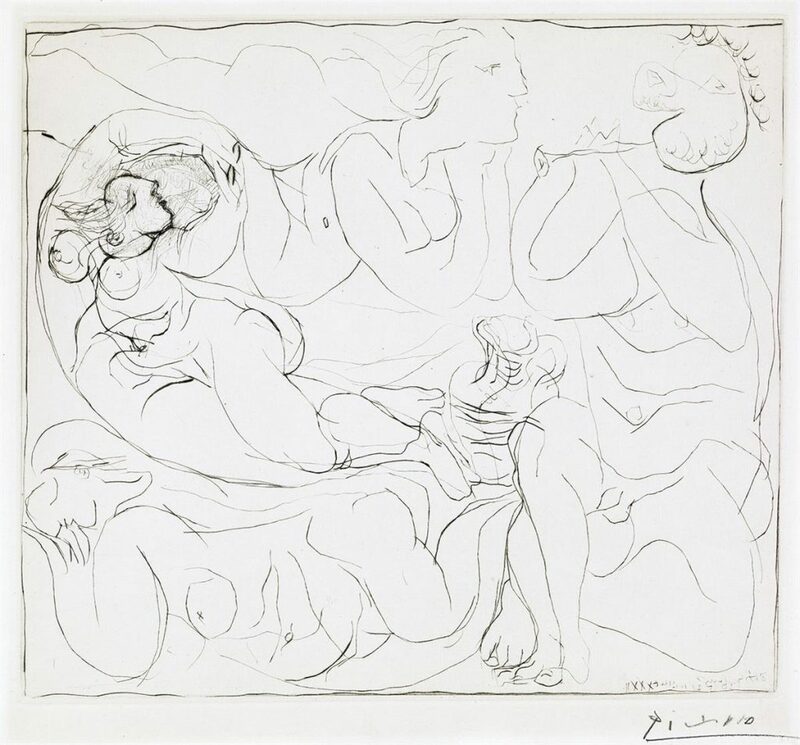 Lot 335: Pablo Picasso, Flûtiste et Trois Femmes nues, etching and drypoint, 1932. Estimate $8,000 to $12,000. Flûtiste et Trois Femmes nues is one of the 100 Neoclassical style subjects Picasso etched for the now famous Suite Vollard. The suite begins with etchings exploring the theme of the sculptor’s studio, including representations of Picasso’s then mistress, Marie-Thérèse Walter. For more in our November 1 sale, browse the full cataglogue.